I got Vol. 2 of Golden Lotus, but before disappearing into that I finished up 彷徨 Fǎnghuáng (Wandering), a set of short stories by 鲁迅 Lǔ Xùn. 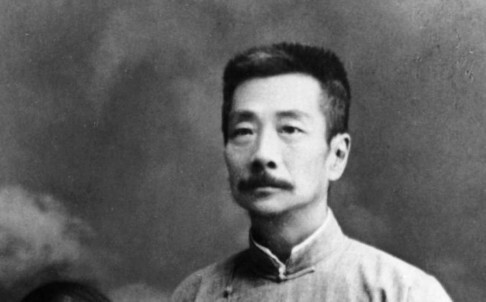 Lǔ, who died in 1936, is considered one of China’s greatest modern writers. He was sympathetic to Marxism but never a CCP member. After reading the book I’m not surprised; an enthusiastic ideology was not his sort of thing. 阿Q正传 “Ā Q Zhèngzhuàn (The True Story of Ah Q)”. You can read it in English here. “Ah Q” is a strange story. The title character is a handyman, someone who does odd jobs; he has no home but a temple lets him sleep in a back room. He’s depicted as a complete loser, ignorant and ugly, bigoted and sexist, and yet possessed of exceptional self-esteem. He thinks he’s a powerful and witty fellow, better than even the local nobles, and though his daily life is a series of losses and humiliations, he manages to turn them into victories in his mind. He comes to a tragicomic end— put to death for someone else’s crime during the turmoil of the 1911 revolution. Contemplating death, his chief preoccupations are the difficult task of drawing a circle to represent his name (the Chinese equivalent of an illiterate’s X), and the even greater one of singing a mocking song as he’s paraded around town. He can’t think of anything. The story makes more sense if it’s understood as an acerbic portrait of China itself. Ah Q’s combination of backwardness and arrogance, startling in a mere human, works as a despairing picture of the Chinese as a whole in its time (the story was written in 1921). Curiously the story was well received— presumably everyone took it as a savage, recognizable depiction of someone else. The wittiest is “A Happy Family”, about a writer who’s trying to produce an article for a wholesome family magazine— an article about a happy family— that is, one entirely unlike the ones in the book. He’s completely unable to do it— he can imagine a happy couple but it has no connection to his life. Also mostly comic is “Soap”, where a man sends his son to look up a word the “foreign devils” had called him, and also buys a bar of foreign soap for his wife. A number of the stories could be called feminist fables— influenced by Ibsen’s A Doll’s House, name-checked here. One, “Regret for the Past”, is the story of a marriage that goes bad once the author loses his job; the narrator devolves from optimistic devoted husband into a depressed failure who drives his wife away. Fun stuff. There’s a flash of the Ah Q wit in “The Divorce”, about a woman who wants to cause as much trouble as possible when getting a divorce. She pleads her case eloquently, but becomes terrified when the judge whispers something to a servant— she is afraid that something terrible is about to happen, and quickly accepts the offered settlement. It turns out the judge was just calling for a pinch of snuff. “The New Year Sacrifice” is another story of a woman whose only escape from patriarchal roles is getting sick and dying. Should you run out and read it? Hard to say. It’s a fascinating evocation of Lǔ’s epoch– the quiet couple of decades between the Revolution and the Japanese invasion. What comes across most clearly is that people had grand aspirations but no real clue on how to achieve them, either nationally or personally. It’s hard to do your part in modernizing China when it’s a struggle just to get or keep a job.